The French-Alpine is a breed of goat that originated in the Alps. The goats of Alpine type that were brought to the United States from France where they had been selected for much greater uniformity, size, and production than was true of the goats that were taken from Switzerland to France. The Altai Mountain breed of wool goat was formed between 1944 and 1982 on collective farms of the Gorno-Altai Autonomous Region of the former Soviet Union; it is kept on pasture all the year round. The Altai Mountain is the result of Don goats used for improvement of the local goats. The Anatolian Black raised in Turkey for its meat, milk and fiber. They are part of the Syrian type and while usually black they are sometimes seen in brown, gray or pied. Anglo-Nubians were developed in England by crossing British goats with bucks of African and Indian origin. 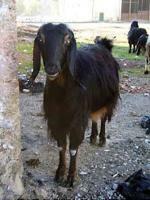 The Anglo Nubian is an all-purpose goat, useful for meat, milk and hide production. It is not a heavy milk producer but has a high average butter fat content (between four and five percent). The Anglo Nubian breeding season is much longer than that of the Swiss breeds so it is possible to produce milk year round. The Angora goat originated in the district of Angora in Asia Minor. The Angora dates back prior to early biblical history. Mention is made of the use of mohair at the time of Moses, which would fix the record of the Angora some time between 1571 and 1451 B.C., according to the Angora Goat Mohair Industry publication from USDA (Miscellaneous Bulletin 50, 1929). Mohair became a valuable product in commerce early in the nineteenth century. In order to increase the supply of mohair available for export to the European countries, the Turks crossed the Angora goat with common stock to increase the poundage of salable hair. Probably there was no effort to keep the original Angora separate, and the general increase in size and vigor of the goats in the Angora area was, no doubt, partially the result of this infusion of other blood. Appearance: The Appenzell Goat is a pure white goat with mid-length hair. It has a powerful, harmoniously built body. The limbs are powerful and well positioned. The body is somewhat broader than that of the Saanen and therefore somewhat smaller. This goat is bred hornless. The height of the whithers is said to be 75 to 85 cm with bucks, and 70 to 80 cm with the nannies. The male animals are on average 65 kg in weight, and the female approx. 45 kg. The Arapawa goats are among the few survivors of the Old English milch (milk) goat which is now extinct to their native England. They may have been introduced as early as the late 1830s by the first European settlers, who established a shore whaling station on the island. The feral or wild goat has been present in Australia in quite large numbers since the turn of the century. This breed was formerly feral at Blithfield Hall, Staffordshire, England but has become scattered since 1957. The breed is nearly extinct. The Barbari is a meat type breed that is found in Mathura District of Uttarpradesh, as well as Gujrat, Jhelum and Sargodha districts in Pubjab Province. The Beetal is a breed used for meat and milk production. The Benadir breed is found in the Webi Shibeli region of southern Somalia. The "Bionda dell' Adamello" is a local goat from the northern Italian Region of Lombardia. This breed takes its name from the color of its hair - Bionda in Italian means Fair - and from the mountain "Adamello" which is part of the Italian Alps. They belong to the goat population called "Alpine," from which, for years, many breeds have originated, and today still live in the European Alpine regions. This breed is found in the Bengal, Bihar and Orissa regions of northeastern India and throughout Bangladesh. They are a meat and dairy breed which are small to dwarf in stature. The Boer is an improved indigenous breed with some infusion of European, Angora and Indian goat breeding many years ago. Several researchers agree that the indigenous populations were probably from the Namaqua Hottentots and from southward migrating Bantu tribes. The name is derived from the Dutch word "boer" meaning farmer and was probably used to distinguish the native goats from the Angora goats which were imported into South Africa during the 19th century. The present day Boer goat appeared in the early 1900's when ranchers in the Easter Cape Province started selecting for a meat type goat. Appearance and Characteristics: The Booted Goat is a robust, vivacious, easily satisfied breed not specialized for milk production which is well suited for extensive keeping under extreme topographical and climatic conditions, most of all in moutainous regions. It is horned, of bright gray-brown to dark red-brown color with black or brown markings (black or brown boots). Typical are the long beard hairs over the back (called Mänteli, meaning “little covering) and on the hind quarter, which are markedly darker or lighter than the rest of the coat of hair. The British Alpine was developed in Great Britian in the early 1900s. The first British Alpines arrived in Australia in 1958 and have since been graded-up using Saanen and Toggenburg does. These goats are found in Spain. The Carpathian goat is found in southeastern Europe and is raised for both meat and milk production. Cashmere the fiber of kings, produced from the lowly Cashmere goat. This fiber is so luxurious that the Arc of the Covenant of the old testament was lined and curtained with it. Sixty percent of the worlds supply of cashmere is produced in China and the remainder from Turkey, Afghanistan, Iraq, Iran, Kashmere, Australia and New Zealand. It is a new industry for the United States. The first Cashmere goats were imported from Australia and New Zealand in the late 1980's. Since then several Cashmere breeders and growers have been producing breeding stock to launch this new industry in the US. This dairy and meat breed found in Switzerland belongs to the Swiss Mountain group. The Changthangi is found in the region surrounding Ladakh in Kashmir, India. The Chappar is a meat type that is found in the Kohistan area of the Sind Province.